Alisanne Ennis took off on a a 10,000-mile globetrotting fundraiser for Marie Curie. A north-east businesswoman who raised thousands of pounds for charity on a globe-trotting adventure says she wouldn’t have succeeded without the kindness of strangers. Alisanne Ennis, 56, set off from her home in Huntly and managed to make it all the way to Miami without spending any of her own money. 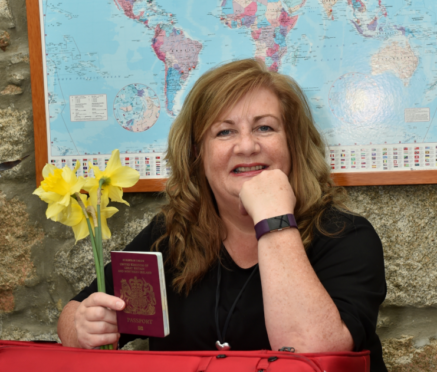 Between support from her family and friends at home, and the new acquaintances she met along the way, the business consultant took in almost £4,000 for Marie Curie during her six-day escapade. “It was intense at times but on the whole I think it worked pretty well,” she said. Mrs Ennis’s journey got off to a great start on May 25, when she arrived at Aberdeen Airport in a bright yellow Marie Curie T-shirt and began telling her story to the passengers and staff on the flight to the States. She said: “I boarded the plane and told the delightful Steve McKay, the customer services director, my plan. “He immediately sprang into action and announced to the cabin that I would welcome some help. While Mrs Ennis had some help from friends during her jaunt in the US, she often had to resort to asking for freebies or even busking with the ukelele she carried in her handbag to earn enough for her next meal. Paying for travel was also a concern, and she clocked up more than 100,000 steps on her fitness tracker by walking instead of taking public transport. But despite all of this this, she took it in her stride and found that the greatest obstacle was not a physical one. She said: “I suppose the most difficult time was when I got to Miami. “But up until then it went really well. “I just had to watch the money I had to make sure I could get a taxi to the airport and had enough to eat. She added: “I raised almost £4,000 to go into the community so I’m pretty chuffed with that.